Dr. Aubrey M. Malphurs is senior professor of pastoral ministries at Dallas Theological Seminary and the author of several books you should own. Dr. Malphurs is a visionary with a deep desire to influence a new generation of leaders through his classroom, pulpit, consulting, and writing ministries. He is involved in a number of ministries ranging from church planting and growth to leadership development. Currently, he is the president of the Malphurs Group and is a trainer and consultant to churches, denominations, and ministry organizations throughout North America and Europe. His newest book, The Nuts and Bolts of Church Planting, is now available and will certainly become a standard for all preparing to plant a church. He was kind enough to answer some questions for the blog. I’ve known Aubrey Malphurs for several years. He has been a great influence on me and my ministry. When I heard he had a new book out, I wanted you to know about it…So here is an interview with Aubrey. Have you ever planted a church? Yes, in the 1970s in Miami, FL. However, I had no idea what I was doing, and I made a ton of mistakes. Would I do it again? No question about it. I’ve never gotten over it in a positive sense. Those were some of the best ministry years of my life. Do you currently train church planters? If so, where and how? Yes, I’ve taught church planting at DTS for around thirty years with tremendous results. I’m delighted that more seminaries today are addressing the topic than ever — especially in the missions departments, but it’s still not enough. Many of the pastoral ministries departments are slowly moving that way. However, there remains an emphasis almost exclusively on homiletics. Not that I’m against teaching homiletics. I like to put it this way: my goal isn’t to teach men to preach but to teach leaders to preach. The planting courses I teach cover the conception stage of church planting that lends itself naturally to the classroom. I’m one for getting students out into ministry, but the conception stage is important and lends itself well to the classroom. Why have you written a book on church planting? Because of the state of the church in North America. What does that mean? The North American churches are in decline perhaps like never before. Eighty to eighty-five percent are plateaued or in decline. It’s not uncommon to hear people use the term post-Christian in describing North America. There is a growing number of unchurched people — especially young people. At the same time, there are a number of cults and religious groups that are growing. I’ve also observed that fewer young people are going into ministry. At the seminary level, my experience has been that not many who are going into ministry are thinking about church planting. All this to say that the solution is twofold — church planting and church re-envisioning. And as Peter Wagner once said, “I’d rather have babies than to raise the dead!” While my ministry (the Malphurs Group) works more with re-envisioning churches, I believe that church planting is what God will use to turn the state of the church around in North America. And it’s my prayer that this book will encourage this. Back in the 1990s, you wrote one of the few books that was available at that time on church planting that has been updated several times and is still selling well. Why did you feel a need to write another book on church planting? Yes, I wrote Planting Growing Churches (Baker Books) when there were only a handful of texts on the topic. And perhaps the number of texts was an indication of a general lack of interest in church planting, at least in North America. But all that has changed. However, there’s always a place for books on church planting. I don’t know if we can have enough. Each new book keeps church planting before the church and the need for the same. I think they encourage and challenge churches to plant churches. They also surface new ideas and ways to pursue church planting. What’s different about this book from your other book and other’s books on church planting? And why is this important? Planting Growing Churches is extensive and covers a ton of material. For many, this has proved to be a most helpful approach. Specifically, it takes one through the conception to birth stages and supplies lots of important information. 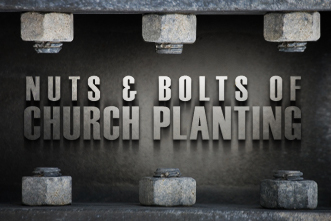 The Nuts and Bolts of Church Planting focuses the church planter more on that which I believe every planter should focus — the process of planting. There are certain key concepts that every planter must consider, such as the mission of the church, its core values, vision, and strategy. Some church planting books present a particular model: purpose-driven, seeker-sensitive, etc. And while these are excellent models, they aren’t for everybody. In planting a church, you must consider where you are, who you are, and when you are. Otherwise, outside of a miracle from God, you’ll experience failure. In other words, what works in Southern California may not work in Snyder, Texas. What would you say is your particular strength in addressing topics like church planting? Are there any other books on church planting out there that you believe would be a good compliment to what you have written in The Nuts and Bolts of Church Planting? There are a number of good books that are out there. And I really like your books. However, I’m not so sure the books that are out complement what I’m doing in that a number present a particular model or way of planting churches that might not work in some parts of the country or with some people groups. Again, certain concepts must be addressed, and Nuts and Bolts explains how to do this. Next articleAre Large Churches Dangerous to Community?